I was so excited when a fellow photographer, Jessica Schilling, posted a call for vendors to come together for a special wedding event in Los Angeles. In the previous weeks, the election results and political climate made people fearful for the future. The idea was to turn around this negative energy following the election and turn it into something positive for our community in the way we do best -- by throwing an amazing celebration of love. We wanted to support local LBGTQ couples and give them the opportunity to get married before the inauguration without losing out on the important wedding day experience. On January 11th, myself and about 40 other wedding professionals in Los Angeles came together for an entire day of free back-to-back elopements for 5 LGBTQ couples at The York Manor in Highland Park. I am so honored to have been a part of such a special day for so many couples and especially the couple I had the pleasure of working with that day: Grace and Joann. 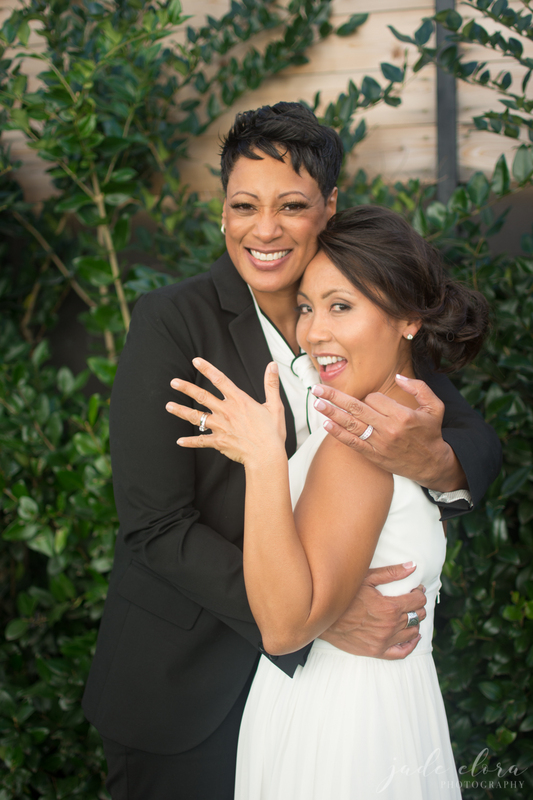 Grace and Joann had their makeup done in separate, adjoining rooms before the ceremony. Grace and Joann's parents walked them down the aisle and witnessed their beautiful ceremony, performed by Jason Lloyd. Yummm! Isn't this cake just beautiful?! Mwokaji Cakery created 5 beautiful cakes, each in the style requested by each couple.